The weather in New Jersey has been weird lately. Some days unusually warm for fall, with some mornings feeling like late winter. I rolled the dice and took a gamble… hoping that impromptu glamping trip wouldn’t be too cold. Egh, weather-wise, it sort of worked out. It was chilly, but not unbearably so. Glamping (n): Activity of spending time in a glamourous camping setting. After some research, I decided to squeeze a quick weekend trip before the cold really set it. It really was super last minute, so a lot of the places I looked up were already booked. 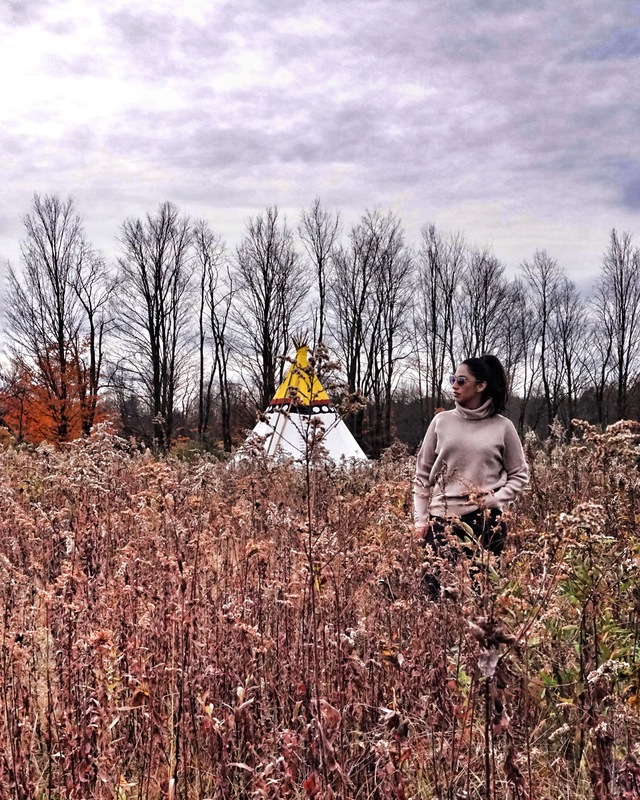 I was lucky to be able to reserve one of the tipis at Mountain Horse Farm Bed and Breakfast in Naples, NY. I have to tell you, the soft plush queen bed and beautiful setting really did make for a better camping experience than what I can ever remember doing as a kid. The owners are so friendly and accommodating, I really had such a wonderful weekend. 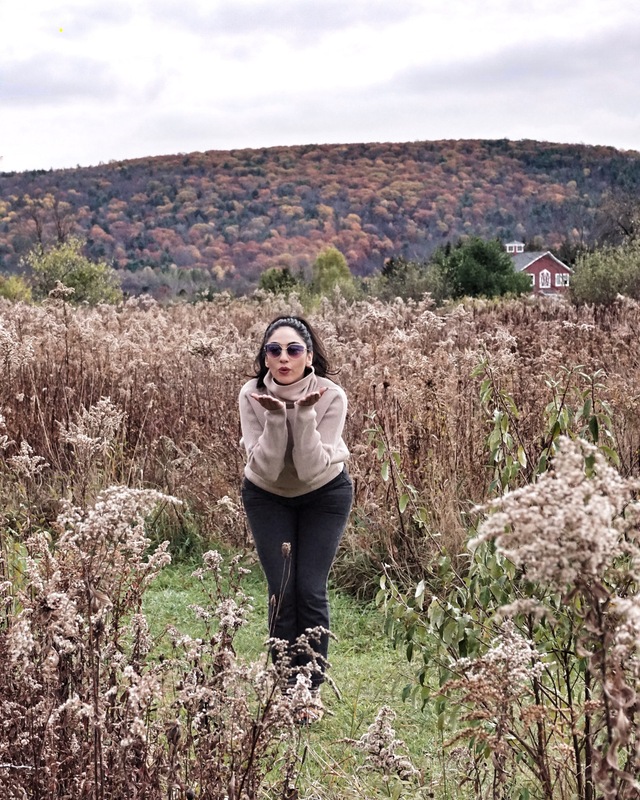 If you want to walk around the property, there is a trail that goes all the way around the carriage house, barn, main lodge, and back to the tipis. There are photo-ops everywhere. There is also a Jacuzzi in the main lodge — which just makes the stay that much sweater sweeter — even though it was totally beautiful and worth a visit, regardless. And, naturally a fire pit — which is BYOW (bring your own wood). The small town of Naples also has a few good bars. Being the alcoholic adult-beverage-connoisseur that I am, naturally I made a point of visiting a few. The Historic Naples Hotel has a bar called the tap room that carries all your standard spirits and beers (insanely inexpensive, might I add) and a bar in their downstairs basement that is a little pricier — but super nice. I had a really good cocktail that was moonshine bourbon and lemonade. 10/10 recommend. I tried to eat at Roots Cafe — which I was told was a “must visit”. But after standing at the “please wait to be seated sign” for what felt like an eternity (and some staff definitely saw me) and not even getting greeted — I decided to try elsewhere. I headed over to the Middletown Town Tavern. The staff was super friendly, the burger and wings were delicious, and the beer was cheap too. I read some really negative reviews from out of state people that didn’t know that all service was at the bar. I guess I was lucky. Because as I mentioned above about Roots Cafe — I would have felt awful getting blown off. If you’re more of a wine drinker, be sure to book tours and wine tastings in the area. There are a number of wineries that all offer them. 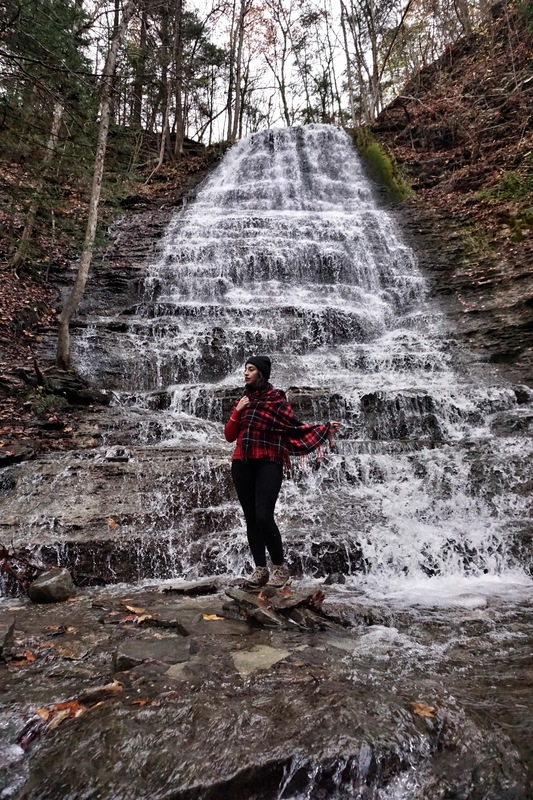 Buuuuut, I skipped the wine tours in favor of a quick and scenic hike — Grimes Glen. Okay, this is not a long hike, but I did find it challenging. The trail has no markers, so you kind of just go by where the ground looks to have been previously trampled. Also, it is extremely wet. The wet leaves and damp earth made me slip a few times. My hiking boots have pretty good traction but I saw some people in ordinary sneakers REALLY struggling. So be careful of that if you go. Besides that, It is not long at all to the waterfall, which is beautiful. 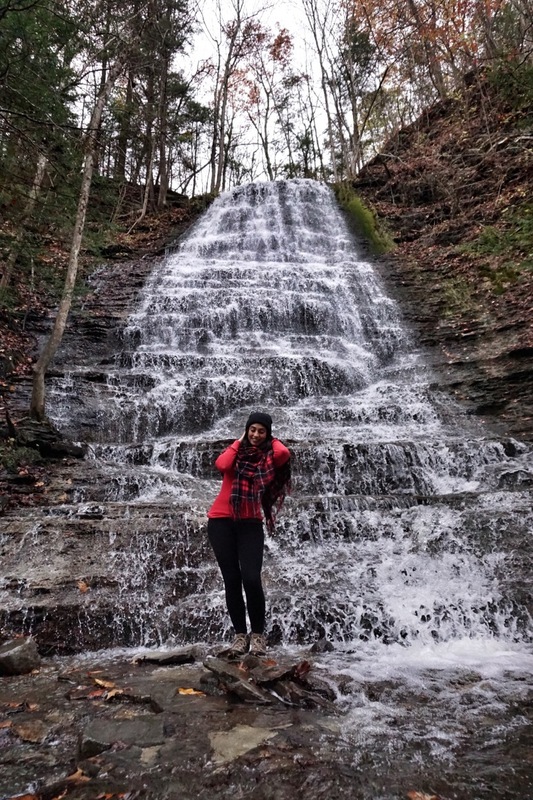 Some online guides said there is a second waterfall with a swimming hole at the basin — but with no clearly defined trail, and my feet already soaked and soggy, I called it a day after going about 1/2 mile past the first one. There is also apparently a pretty dope cave that you have to walk through the creek to get too — but I didn’t want to sacrifice my feet for this wtf, who am I? so again, maybe some other time. Sleeping in the tipi is super comfortable and awesome. But you are still basically outdoors. There is no heat/air conditioning. So if you go in the summer, you will probably be hot. If you go too late in the fall, you will probably be cold. I was prepared for this and packed super warm and I was fine. The blankets are specially designed to trap heat. Suzanne, the owner, gave me the heads up that I might want to bring a hat to sleep in — which I did, and all was well. 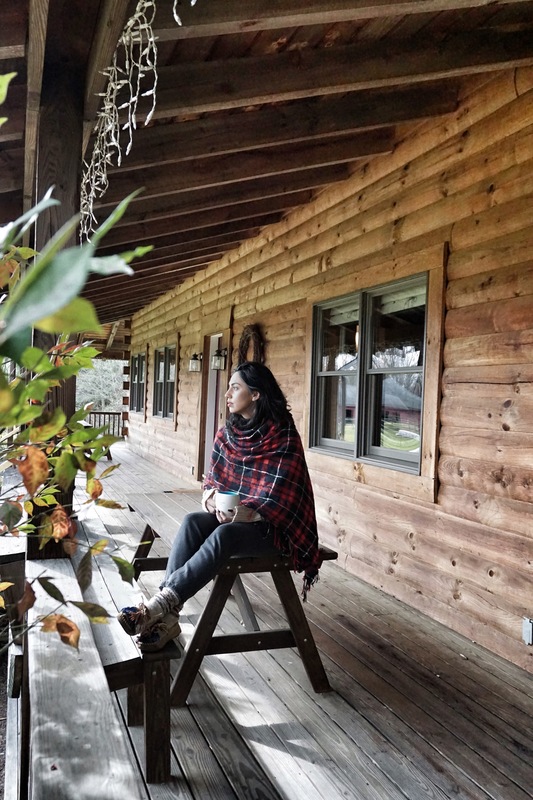 There is no wifi in the tipi — but there is in the lodge. Even with no wifi I still had some service, but not the best F.U. sprint. Plan ahead — for wine tours and tastings and such. Mountain Horse Farm also has spa service, which you need to book in advance. This place is a Bed and Breakfast — I suggest adding the breakfast to your package for a mere $15 per person. One less meal to worry about. Otherwise, you can keep your food in the main lodge. They asked that you don’t keep food in the tipis — because you know, critters. Be prepared to unplug a bit. Sure the lodge has a TV you can watch, and free wifi — but did you really go all that way up there for that? No. Put the phone down and click off the TV. Enjoy nature and the company you keep. Although I had a wonderful time, I would have enjoyed this much more end-of-September/ early-October. Not that the weather was really an issue — but most of the trees have already shed their leaves. A bit of a bummer, but not a deal breaker. 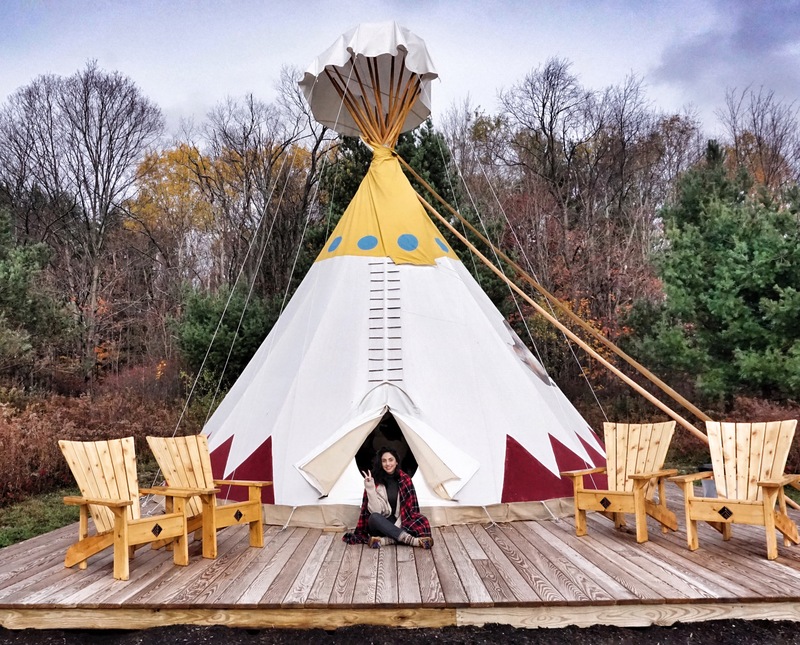 If you don’t think you can hack it in a tipi for a whole weekend, but still want the experience, just book one night and another night in their carriage house. That is what some people that were there did. 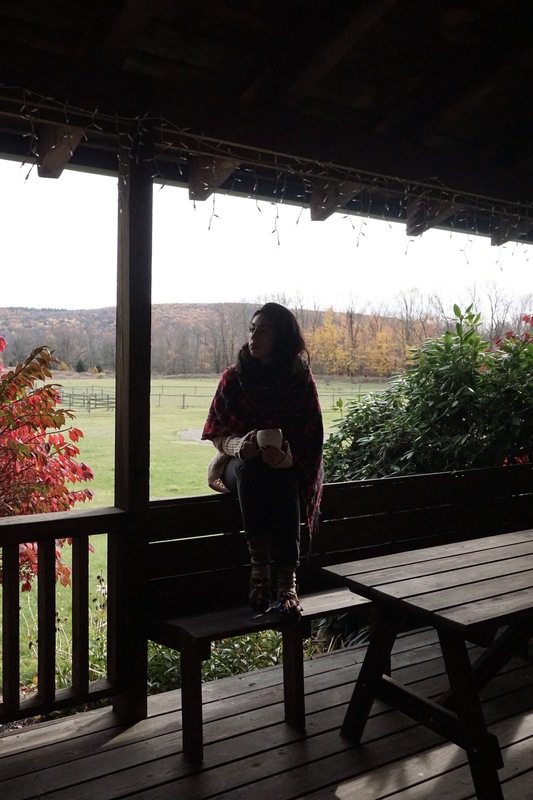 So looooong blog post short, 10/10 recommend a visit to this lovely little B&B.